Frankenthal (Germany), September 30, 2016 – RKW has put a new 10-color flexographic printing machine into operation at the plant in Echte on schedule – before the beginning of the fourth quarter. With this new printing system, the company offers its customers a wide range of design options and high-quality printing images – especially for the self-venting plastic bag ProVent® and other industrial bag solutions. The state-of-the-art machine stands out with its particularly resource-saving and sustainable printing process. 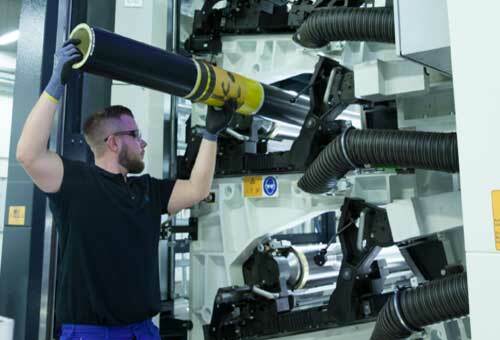 “With the new flexographic printing system, we have extended our competencies at the site in Echte and offer customers a lot of flexibility in terms of layout design, along with a consistent print quality,” says Johannes Heintges, General Manager RKW Echte. 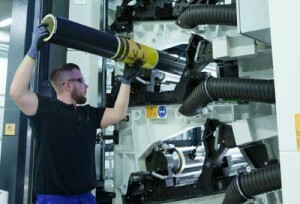 The machine is primarily employed for the self-venting RKW ProVent® plastic bag – the polymer-based alternative to paper packaging for powdery, moisture-sensitive goods. The printing machine has been designed especially in response to the growing demand for complex and premium printing motives. Thus, RKW costumers gain crucial competitive advantages when it comes to product differentiation. Various automation modules ensure the printing process’s high efficiency and quality. The color management system for example recognizes deviations of color shades, checks the values automatically and provides a maximum of color match and consistency. The comprehensive print image monitoring assures a consistently high printing quality from one end of the roll to the other, thus avoiding waste. The innovative control system of the Corona pretreatment enables a free design of necessary cutouts for the subsequent, optimized heat sealing of the films. “Including all additional features, we currently operate the most modern flexographic printing machine in Germany,” explains Heintges. The machine as well as the necessary peripheral equipment set standards regarding resource-saving printing. With the investment, RKW follows the principle of sustainability, which is an integral part of its corporate policy. The color and cleaning system reduces changeover times during color changes, saving material and energy. Even full surface varnish applications require no additional effort due to special cleaning features. The automatized color mixing system works very resourcefully with the components that are being used: Solvent vapors are automatically sucked in, burned and, thus, recycled thermally. The resulting energy is used for the drying system of the printing machine. Soiled solvents are distilled and re-used. This contributes to a reduced consumption of solvents. Additionally, the color mixing system reintegrates surplus colors into new color mixtures via software calculations.